George Soros’s deep-pocketed posse is now gunning for the toughest sheriff in America. 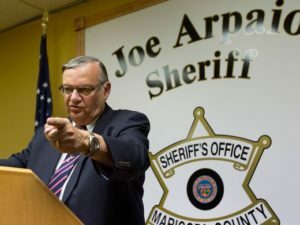 A group called Maricopa Strong, funded by the liberal hedge fund tycoon, is seeking to prevent Maricopa County, Arizona Sheriff Joe Arpaio from winning a seventh consecutive term. Soros has been picking, and winning, several fights in local races this election season, but Arpaio is not likely to lay down, especially considering his $2.9 million campaign war-chest. His opponent, former Phoenix police sergeant Paul Penzone, had raised a total of $326,000. Penzone lost to Arpaio by 6 percentage points in 2012. The entry of the Soros-linked group, however, is a huge gift for Penzone, who acknowledged he could never come close to matching Arpaio’s campaign spending. In New Mexico, Soros gave $107,000 to Raul Torrez, the winner of the Democratic primary for the county that encompasses Albuquerque. Republican Simon Kubiak dropped out, saying he could not raise the money he would have needed to counter the Soros-funded Torrez and because he feared a barrage of negative ads. In Florida, the incumbent prosecutor for the Orlando area, who was well-known for prosecuting the Casey Anthony case, said Soros’s money tipped voters against him during the last month of his campaign before the Aug. 30 primary. Chad Willems, Arpaio’s campaign manager, said he suspected a well-funded anti-Arpaio group from outside Arizona would get involved in the campaign but doubted it would prevent Arpaio from winning. “He is a known commodity here. The voters do still like him,” Willems said.